A couple of weekends ago, I was given the opportunity to participate in the Biggest Losers' 5K walk/race at the Cotton Bowl here in Dallas. Apparently, they were highlighting the unflattering fact that Texas is home to 5 of the "fattest cities in America". While listening to a radio show in the morning, after dropping kids off at school, I got lucky and was one of the 25 people that called in to get a spot! 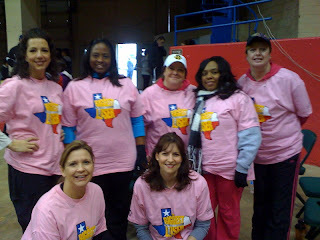 I quickly recruited as many women as possible from McKinney Boot Camps to come with me! With very short notice, we were able to get 7 together, and all headed down to the cotton bowl at 6:30am on a very chilly Sunday morning. Most of the girls that went with me are 5am boot camp girls....so giving up their Sunday morning sleep in was a bit of a sacrifice :) It was early, and cold - so after a trip through Starbucks for some of us, we were off. We arrived at the Cotton Bowl and surprisingly, there weren't many people in the parking lot. We assumed there would be hundreds, if not thousands there to take part. After bundling up and heading towards the entrance, we saw a door marked "extras" to the right and headed in. Once inside, we found the sign in desk and got to choose which contestant we wanted to pair up with! The excitement was in the air....and we knew we were going to be a part of something really fun. This has become a treat that I enjoy and wanted to share....very simple and really yummy. Greek yogurt with frozen berries...so delicious.